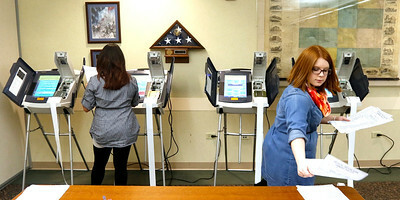 H. Rick Bamman - hbamman@shawmedia.comCounty clerk's office employees Jasmine Resendez (left) and Brittany Johansen test ballot machines for the primary election earlier this month. 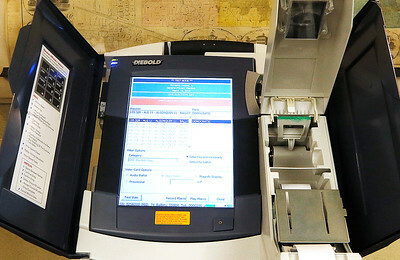 McHenry County Clerk Mary McClellan has been refurbishing and updating the county's voting machines as needed including replacing batteries, reimaging the tablet screen and testing for accuracy. 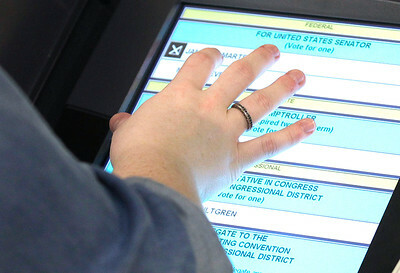 H. Rick Bamman - hbamman@shawmedia.com County clerk's office employee Brittany Johansen tests a touch screen ballot machine earlier this month at the clerk's office in Woodstock. County Clerk Mary McClellan has been refirbishing and updating the county's voting machines as needed. This year, as Americans select the next president, the entire U.S. House of Representatives and a third of the Senate, as well as an array of state and local officials, many voters will cast ballots on a generation of electronic voting machines that is nearing their life expectancy. H. Rick Bamman - hbamman@shawmedia.com McHenry County Clerk Mary McClellan has been refirbishing and updating the county's voting machines as needed. This year, as Americans select the next president, the entire U.S. House of Representatives and a third of the Senate, as well as an array of state and local officials, many voters will cast ballots on a generation of electronic voting machines that is nearing their life expectancy. 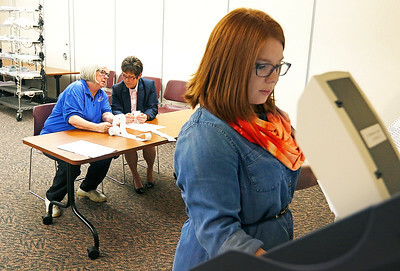 H. Rick Bamman - hbamman@shawmedia.comDemocratic Party representative Kathy Bergan Schmidt, (background left), and McHenry County Clerk Mary McClellan compare print outs of test results while clerk's office employee Brittany Johansen runs a test on a touch screen voting machine. The two day testing process insures each test vote cast for every candidate is accuratly tabulated. 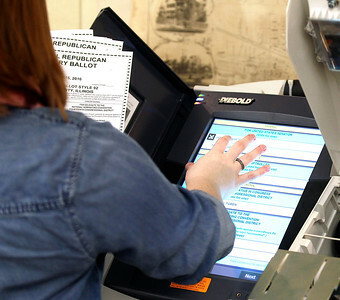 County clerk's office employee Brittany Johansen tests a touch screen ballot machine earlier this month at the clerk's office in Woodstock. County Clerk Mary McClellan has been refirbishing and updating the county's voting machines as needed. This year, as Americans select the next president, the entire U.S. House of Representatives and a third of the Senate, as well as an array of state and local officials, many voters will cast ballots on a generation of electronic voting machines that is nearing their life expectancy.